Hannukah and Christmas are just around the corner and in our house we celebrate both holidays so we call the season Hanukamas. In case you were wondering what to get me this year I have some ideas for you. Quite possibly the best tinted lip balm ever, Sugar is hydrating, long lasting and smells like lemons. I love that this kit includes all of their tinted lip balms. Whoever designed this collection is a genius. 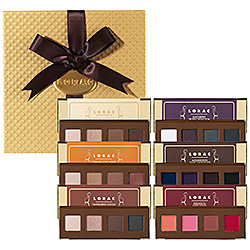 Eye Candy includes six individual pallets that look like candy bars. Four of the six pallets are eyeshadows, one is a cheek and lip pallet and one is a creamy eyeliner pallet. All the colors are extremely wearable and portable. Is it a prerequisite or something that we wear something sparkly at the holidays? Is it so we match the tinsel on the trees? 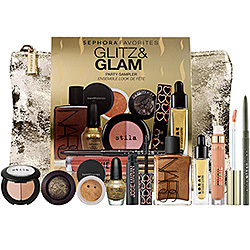 I don’t know but I love this collection of Sephora’s best sparkly products. This collection includes a little of everything – eyeshadow, lipgloss, nailpolish and much, much more. Plus it comes in a sparkly bag. Love! What do you want for Hanukamas this year?